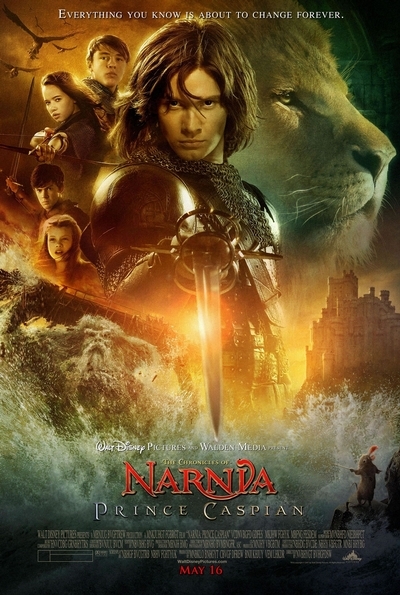 Story: One year after the incredible events of "The Lion, the Witch and the Wardrobe," the Kings and Queens of Narnia find themselves back in that faraway wondrous realm, only to discover that more than 1300 years have passed in Narnian time. During their absence, the Golden Age of Narnia has become extinct, Narnia has been conquered by the Telmarines and is now under the control of the evil King Miraz, who rules the land without mercy. The four children will soon meet an intriguing new character: Narnia's rightful heir to the throne, the young Prince Caspian, who has been forced into hiding as his uncle Miraz plots to kill him in order to place his own newborn son on the throne. With the help of the kindly dwarf, a courageous talking mouse named Reepicheep, a badger named Trufflehunter and a Black Dwarf, Nikabrik, the Narnians, led by the mighty knights Peter and Caspian, embark on a remarkable journey to find Aslan, rescue Narnia from Miraz's tyrannical hold, and restore magic and glory to the land.